Congrats to Michael Tikhomirov (Moscow IPT The Sun team), who finished 4'th in TCO-2014 Finals! 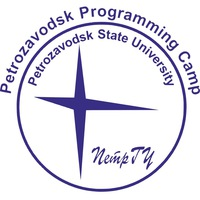 In Moscow IPT started IV Training Camp in Competitive Programming. 21.11.2014 personal contest for players involved in MIPT Trainig camp 2014 will be held by Codeforces on round 278 div1 problems. First 20 contestants from the MIPT Training camps will be awarded by Codeforces T-Shirt. First, second and third place between those players will be awarded by medals as individual contest winners. To participate please fill this form. Moreover, you can read about this structure in http://adilet.org/blog/25-09-14/ and http://codeforces.ru/blog/entry/13959 (second link only in Russian). 20.11.2014 (чт) 15:40. Problem B of the 2014 Hard Blitz (Elevator) contained incorrect tests with T>100,000. Those tests are removed, all affected solutions are rejudged. 20.11.2014 (чт) 15:00. Eleventh round of the Training Camp - Another European Regional - is over. 18.11.2014 (вт) 20:09. Eighth round of the Training Camp - Almost East Siberian Blitz - is over. 18.11.2014 (вт) 18:45. Tenth round of the Training Camp - 2014 Hard Blitz - is over. Congrats NRU HSE #1 (Kolosov, Samelyuk, Iskhakov) on their first victory at Moscow IPT Training Camps! 18.11.2014 (вт) 15:20. Ninth round of the Training Camp - Xi'An Asia Regional 2014 - is over. 18.11.2014 (вт) 15:00. Seventh round of the Training Camp - Geometry Contest - is over. Special link from Michael Rubinchik for work on Geometry contest problems is posted. 16.11.2014 (вс) 16:20. Sixth round of the Training Camp - Grand Prix of Central Europe (AMPPZ-2014) - is over. You may download analysis of the contest in PDF (English). 14.11.2014 (пт) 18:40. Fifth round of the Training Camp - Alexander Milanin Contest - is over. 14.11.2014 (пт) 13:30. Fourth round of the Training Camp - Optimization Contest - is over. Additional materials can be found here. 13.11.2014 (чт) 18:30. Third round of the Training Camp - East-West Blitz Contest - is over. Congrats Saratov SU 1 (Kudryashov, Gusarov, Kudasov) on their first victory at Moscow IPT Training Camps! 13.11.2014 (чт) 15:00. Second round of the Training Camp - Vasily Astakhov Selection 4 - is over. Congrats Moscow SU Trinity (Akhmedov, Gorbunov, Shlyunkin) on their first victory at Moscow IPT Training Camps! 12.11.2014 (ср) 23:00. First round of the Training Camp - Japanese Alumni Group Autumn Contest 1 - is over.